Autotrol ® Well Pro TM Dry Pellet Chlorinator. This compact, low-profile unit blends comfortably into any home landscape and it was designed specifically for residential use. The Well PRO chlorinator maintains your yard's aesthetics! The Well PRO chlorinator is constructed of rugged, matte-black thermoplastic to resist corrosion from chlorine or the weather and mounts directly over your well. The Well PRO chlorinator's EPA-registered dry pellets maintain their chlorination power, so there's negligible chemical loss through evaporation. Freezing weather won't affect the integrity of the pellets, either. The Well PRO chlorinator pellets drop down throughout your well for even, consistent chlorine dispersal. And because the Well PRO chlorinator's pellets are so highly concentrated, a small quantity lasts a long time. A single 3 1/2-pound container is usually enough to treat the water supply for a family of four for several months. Since most water problems originate in the well, it makes sense to treat them at their source—in the well itself. That's why the Well PRO chlorinator uses your well as the retention tank to keep chlorine in contact with your well water as long as possible for maximum effectiveness. Safe, simple, fast loading with prepackaged Well PRO pellets. The Well PRO chlorinator's highly concentrated dry chlorine pellets come in easy-to-store, easy-to-handle 3 1/2-pound containers that actually serve as the chlorine hopper. Each new container is simply screwed right into the chlorinator to replenish the chlorine supply, so you never need to handle any chemicals directly. And there are no fumes or spills to worry about. After opening the Well PRO chlorinator's protective cover, remove the power module and unscrew the cap from a full container of Well PRO pellets. Screw the power module directly onto the full pellet container. 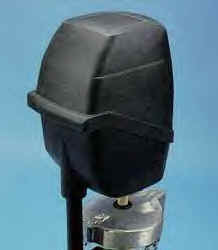 Insert the power module/pellet container assembly in the Well PRO chlorinator protective housing and replace the cover. Design simplicity ensures trouble-free performance. Designed specifically for outside installation, the Well PRO chlorinator's rugged weatherproof construction ensures reliable, uninterrupted operation in any weather. Easy to install and easy to service if necessary, the Well PRO chlorinator features precision-tooled, injection-molded components, few moving parts and a full array of performance features. The plug-in power module is completely encapsulated in polyurethane foam to protect it from chlorine corrosion and requires no routine servicing or maintenance. The rugged drive motor turns on and off according to water demand to maintain a consistent chlorine residual in the water. The adjustable dosage rate makes the Well PRO chlorinator adaptable to a wide range of water problems and water usage characteristics. System operation based on water usage. The Well PRO chlorinator is energized only when the well pump operates. Chlorine consumption is minimized and chlorination efficiency is maximized. An automatic shutoff device prevents over-chlorination if the well pump remains on for an extended period. After opening the Well PRO's protective cover, remove the power module and unscrew the cap from a full container of well PRO pellets Screw the power module directly onto the full pellet container Insert the power module/pellet container assembly in the well PRO protective housing and replace the cover. Well Pro Pellets are available by case. Note: Hazardous material fee included in shipping charges.